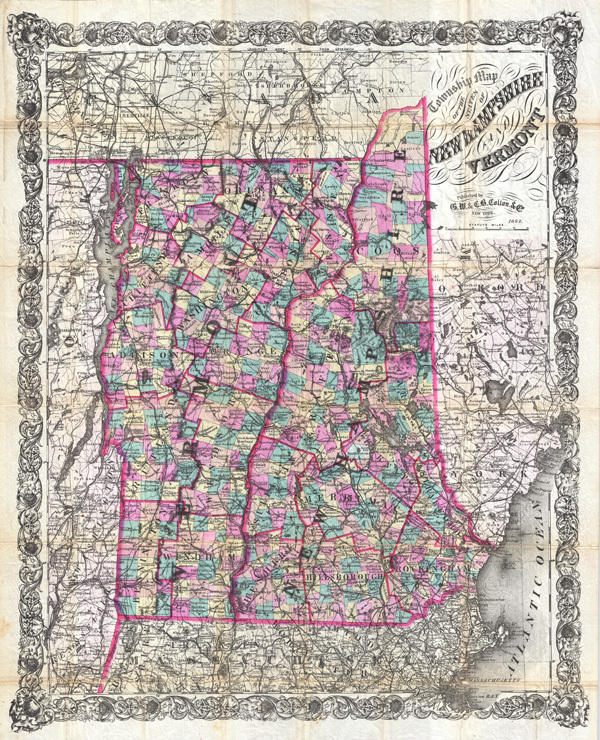 A fine example of C. W. and C. B. Colton's 1892 pocket map of New Hampshire and Vermont. Decoratively produced on a large scale this map covers all of Vermont and New Hampshire as well as adjacent parts of Massachusetts (including Boston), New York, and Maine. Offers color coding according to county and district divisions. Shows roadways, rail lines, lakes, rivers, canals, and some topographical features, especially in the Green and White Mountains. Surrounded by a magnificent vine motif border. Very good. Original fold lines exhibit some wear and verso reinforcement. Accompanied by but detached from original binder. Cobb, D. A., New Hampshire Maps to 1900, 466. Harvard Map Collection, HOLLIS, 009548230.